Shrimp is possibly the most effortless seafood to prepare. It cooks quickly and pairs wells with many herbs and seasonings. This recipe is quite simple but requires at least two hours in the refrigerator for the seasonings to meld; best if left over night. Fill them into endive spears and you'll have an enticing appetizer or side dish. Alternatively, serve over savory polenta for a satisfying entree. Whichever way you choose to serve this dish, you will come back to it time and again, whenever you need a simple but gourmet idea for shrimp. 1. Add garlic, salt, pepper and cilantro to shrimp. 2. 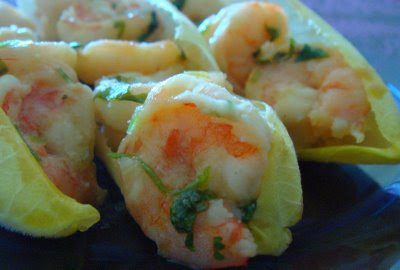 Squeeze limes and add juice to seasoned shrimp. Limes should yield about one third of a cup. 3. Cover bowl will plastic wrap and refrigerate for at least at least two hours, preferably over night. 4. Heat a large skillet over medium high heat. Add two to three tablespoons of olive oil. 5. Using a pair of tongs, remove the shrimp from its marinade. Reserve leftover marinade to prepare sauce. 6. Cook shrimp for 3 to 4 minutes until pink and cooked through. Remove from skillet and transfer to a heat proof bowl; cover tightly with aluminum foil. 7. Pour reserved marinade in skillet and add wine. Cook over medium heat until reduced by half, about 15 to 20 minutes. 8. Strain wine reduction and return to pot. Add corn starch and cook for an additional two to three minutes until slightly thickened. 9. Serve shrimp in endive spears and drizzle with Riesling sauce.